WASHINGTON — Tom Price resigned Friday as President Donald Trump's Health and Human Services Secretary, after days of public outcry over his use of private jets to conduct government business, costing taxpayers hundreds of thousands of dollars. "I have spent forty years both as a doctor and public servant putting people first. I regret that the recent events have created a distraction from these important objectives," Price said in his letter of resignation. "Success on these issues is more important than any one person." Before the White House announced that it had accepted Price's resignation, Trump referred to the secretary's fate as he departed the White House for Bedminster, New Jersey, calling Price a "fine man" but reiterating his displeasure about his use of private jets for multiple trips on government business. "I don't like the optics," Trump said. Price's 261 days in office make him the shortest-ever serving Health and Human Services Secretary, including among leaders in the years when the agency was still known as the Department of Health, Education and Welfare (1953-1979) and when it was part of the Federal Security Agency (1939-1953). His exodus is the latest in a string of high-profile departures from the Trump administration — many of which have happened on Fridays. White House Press Secretary Sean Spicer resigned on a Friday in July, followed one Friday later by Chief of Staff Reince Priebus. Two weeks later, Steve Bannon, the president's chief strategist, was also out. 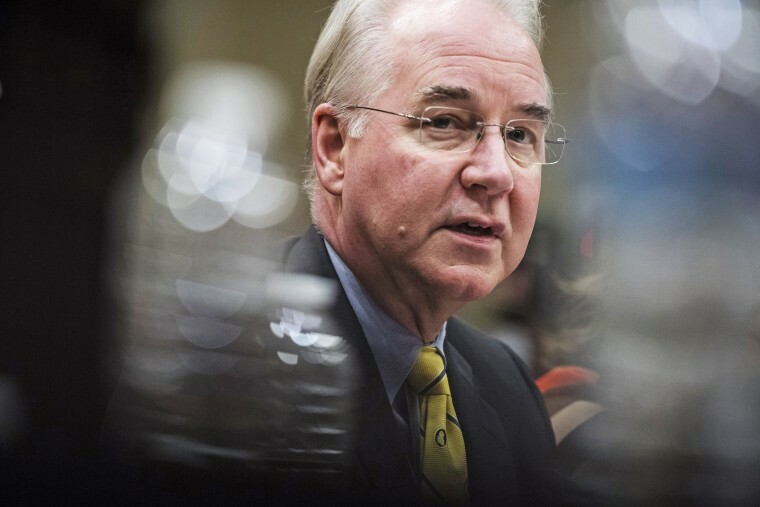 On Thursday, Price said he would pay taxpayers back and promised to "take no more private charter flights as Secretary of HHS. No exceptions." A department spokeswoman told NBC News that Price would write a personal check to the Treasury for $51,887.31 — making good on his promise to pay for the "expenses of my travel on private charter planes" and ensuring tax payers don't "pay a dime for my seat on those planes." But by Friday morning, Politico, which first reported the story of Price's charters last week, reported more trips via military aircraft abroad that put the total cost of his travel upward of $1 million. House Democratic Leader Nancy Pelosi said that Price "never should have been in this role in the first place" and called on the administration to work with Democrats to improve Obamacare, which Price staunchly opposed as a member of Congress before accepting the Cabinet position. "The American people deserve a Secretary of Health and Human Services who believes in health care for all Americans," Pelosi said in a statement. Since being confirmed in February, Price was tasked with heralding Republican efforts to repeal and replace Obamacare through Congress, which would have made good on one of Trump's signature campaign promises. Those attempts repeatedly failed in the Senate, most recently when the Graham-Cassidy health care bill couldn't garner enough GOP support to make it to the floor for a vote. Still, Republican lawmakers praised Price for his efforts around health care. House Speaker Paul Ryan said the former secretary was vital to the House passing its health care bill, though the measure would later fail in the Senate. "His vision and hard work were vital to the House’s success passing our health care legislation. I will always be grateful for Tom's service to this country and, above all, his continued friendship," Ryan said in a statement. Price was not the only member of the president's Cabinet to come under fire in recent weeks for using a private jet for government travel. Interior Secretary Ryan Zinke, Treasury Secretary Steven Mnuchin and EPA Administrator Scott Pruitt have also chartered jets on the taxpayer’s dime since the start of the Trump administration. The White House said it intends to designate to designate Don Wright as acting Health and Human Services secretary. Wright is currently the deputy assistant secretary for health and director of the Office of Disease Prevention and Health Promotion. Friday was not the first time Trump threatened Price's job. In a July speech to the Boy Scout Jamboree in West Virginia, Trump joked about Price's efforts on selling a health care bill to lawmakers. "You gonna get the votes?" he asked Price, who replied that he hoped so. "You better," Trump said. "Otherwise I'll say: 'Tom, you're fired!'"